The next time you hear ground tell someone to park in front of the "tower" at Opa-locka Airport in Florida, don’t be surprised if you hear laughing on the frequency. 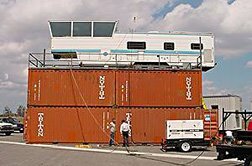 That is because for the next three years, Opa-locka Airport's "control tower" will be an old temporary FAA trailer perched atop a couple of cargo containers welded together. The containers were welded because there just wasn't enough baling wire around to do the job. To get inside the cab, Controllers must climb a ladder, and at only 33 feet off the ground, ATC can't see the entire airfield. Not that Opa Locka is some sort of out-of-the-way field either. It was less than a year ago that the airport saw one of its busiest times -- when corporate jets descending on South Florida arrived there for Super Bowl XLI in February. The FAA moved into the temporary control trailer in May because the old 141-foot-tall tower is falling apart. A squabble over money between the county's Aviation Department and the FAA has stalled construction of a new $11 million facility. The FAA says the temporary tower is perfectly fine for handling traffic, despite parts of the ramp and taxiways becoming blind spots for ATC. So while technically this rig might serve as a “tower”, one has to wonder why the elite FAA’s “deciders” didn’t come up with something a tad more appealing to the eye, like maybe cardboard boxes taped together in a nearby tree. Or, maybe this is all the FAA can afford after the Bushies were through slashing the Airport Improvement Program. AOPA said the cuts were going to be bad, but this is a little extreme.